York City go into Saturday’s clash with the Cobblers sitting rock bottom of Sky Bet League Two. The Minstermen’s very existence as a Football League club is in peril, and they know they have a huge fight for survival ahead of them over the final 19 games of the season. It is a position and a challenge that Cobblers boss Chris Wilder knows only too well, and is the reason he will be drilling warning after warning into his title-chasing players against any sort of complacency ahead of the weekend meeting. Wilder and the Cobblers may well be sitting pretty at the top of the table, two points clear of second-placed Plymouth Argyle with two games in hand. But rewind two years and it was Town, with Wilder having just taken over the helm, who were staring into the non-League abyss, a huge six points adrift at the bottom of the Football League. The situation looked hopeless, but somehow Wilder and his players got the results to get themselves out of a very deep hole, and that is precisely why he sees York as such a threat on Saturday. “York are fighting for their life,” said Wilder. “Everybody will look at the fixtures from now, and will see teams at the top playing teams at the bottom and say ‘well, that’s three points there, that’s three points there’, but it doesn’t work like that. “There are going to be games between now and the end of the season where the top teams that are going well, and we are in that group, will come unstuck. “It is important that we look after ourselves and take care of our own business, but these games are difficult, we proved that with the run we went on when we were down there. “I think we showed play-off form when we were bottom of the league, and we won games of football when we were in a worse position than York City. 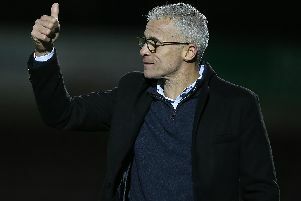 “There is going to be fight, York have got a proud tradition, some good players, a new manager that has come in and they will be desperate to stay in the Football League. “It represents another difficult afternoon, although it will only be difficult if we don’t apply ourselves. As always, the Cobblers have done extensive homework on their opponents, with Alan Knill taking in York’s 2-1 win over Stevenage at Bootham Crescent last Saturday, a victory that was enough to see them draw level on points with second-from-bottom Dagenham & Redbridge and move them to within four points of safety. “While the players were having last weekend off, we were all in different parts of the country,” said Wilder. “I headed south and Alan went north for a nice weekend break with his wife in York! Obviously, for three hours he had to go and do a game and he was impressed by York City. “They showed plenty of fight and desire. “I keep saying it, as a club we know from experience when you are in the position where your Football League existence is at risk, how much clubs dig a little deeper, and how players go a little bit further. “We recognise this is going to be a tough test, a tough game for us, and it is a free hit for them because of the run we are on, and the position they are in. “I should imagine everybody will be expecting a comfortable home win, but we are going to have to play extremely well again, and we are going to have to show all of the attributes and qualities that have won us games in this division so far this season.